May is national bike to work month and next week is bike to work week. Here in Seattle a big concern is staying dry while bike commuting or during recreational runs. 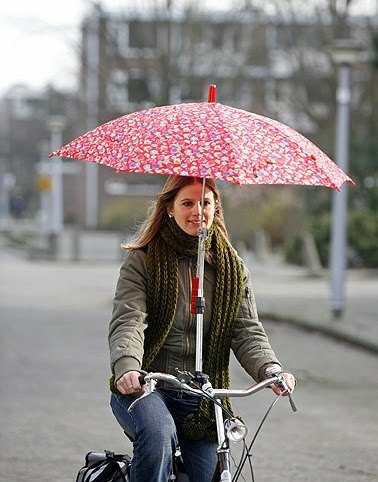 Now there are two ways to stay dry while biking. The first is shown in the image above--mounting an umbrella on your bike. Perhaps this would work if you went REALLY slowly and there was little wind, but for most of us another solution is needed...and I can offer it. Use the weather radar! I commute by bike every day roughly five miles each way. Ever since a weather radar was installed in western Washington (early 1990s), I rarely get seriously wet. I mean...this has really changed my life. You all have seen weather radar images on TV or the web (see one below). Weather radar basically shows you where it is raining. The units shown on the image are actually something called reflectivity, the amount of the radar signal scattered back to the radar. The higher the reflectivity, generally the heavier the rain. A rough scaling is 5-10 (gray above) for very, very light rain (drizzle), pinks (15-25) for light rain, greens (30-35) for moderate rain, yellows for heavy rain (40-45), and you don't want to know about the reds and blues. I will bike in greys and pinks, particularly if I am wearing a Gortex (or similar type of material) jacket. I avoid greens and will take the bus with yellow and reds. The National Weather Service radars provide a new image every 6 minutes. And you can view both single time and animated radar imagery on the web, using a smart phone app, on an internet-equipped cell phone, or on tv. An interesting and critical fact about rain is that it is rarely uniform. There are heavy areas and light areas and breaks. By viewing radar animations you can spot the light areas, or make a good estimate when one will be at your location. So if you have some flexibility of when you bike, delaying or advancing your trip by a 10-15 minutes, you can nearly always avoid the real heavy stuff or secure a dry ride even on a supposedly rainy day. The more flexibility you have the better your chance of staying dry. And radar helps in another way. If you are just looking for recreation, the radar can tell you where it is dry now and will continue to be dry for a while. Trust me....using weather radar can revolutionize your biking life. So where do you go to get this information? Lots of web sites offer great radar access. All the major TV stations in town have radar links. And many more.